In addition, the publicly available verified complaint is available as a PDF here or from the LA County Court web site. Legal action filed against Las Virgenes Municipal Water District (LVMWD) tank project cites public safety issues of blasting near dam, Valley Fever risks, lack of emergency plan; with allegations including “colossal failure to comply with California’s public notice statutes”; and asks the Court to invalidate environmental approval, and project approval. April 26, 2014  WESTLAKE VILLAGE, CA — On Thursday, attorney John Tamborelli filed an action against the Las Virgenes Municipal Water District (LVMWD), and its tank project contractors Pacific Hydrotech, and AECOM, on behalf of Petitioner Frank Bonvino. 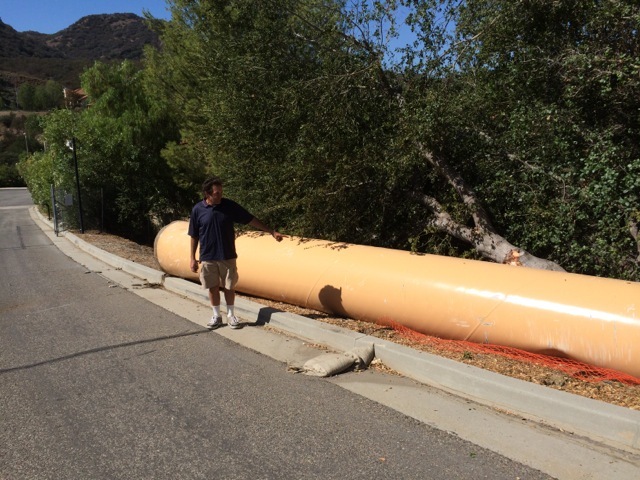 The suit has been filed for the benefit of the plaintiff, the local residents of Three Springs, Westlake Village, and the customers of Las Virgenes Municipal Water District. Included in the comprehensive filing, the action requests the court void the environmental and project approval for the tank project under the California Environmental Quality Act. The District is attempting to build a 5 million gallon storage tank within feet of a 3 billion gallon reservoir. Given the project is commencing, the petitioner is asking for a temporary restraining order, and subsequent hearing for injunction, according to court documents. The court documents filed against the Las Virgenes Municipal Water District allege that the water district’s actions represent a “colossal failure to comply with California’s public notice, and public participation statutes, very possibly intentionally,” an invalid filing of the Notice of Determination, the need for a supplemental Environmental Impact Report, and more. According to court documents filed, Director Barry Steinhardts declaration states he has made a complaint [to] the Los Angeles District Attorney on February 24th, 2014. Currently, the Public Integrity division is in investigation of the complaint.” Steinhardt states his complaint against LVMWD addressed violations of process, the Brown Act, and other public rights. “From the beginning, the water district has shown no regard for public process,” said Neil Ticktin, resident and community leader. Ticktin is a named declarant in the case filed. “We have tried to work with the water district, but they won’t listen,” Ticktin continues. “They’ve given us no choice but to file suit to stop this project,” said Frank Bonvino, plaintiff for the case, as indicated within court documents. Case Number: BC543637 has currently been assigned to Judge Yvette Palazuelos of Los Angeles County Superior Court at the Stanley Mosk Courthouse. Hearing date has not yet been set. Judge Palazuelos’ experience includes presiding over the 21 week trial against AEG Live in the wrongful death case of Michael Jackson.